Greenwich, CT. June 26, 2010. H.R.H. 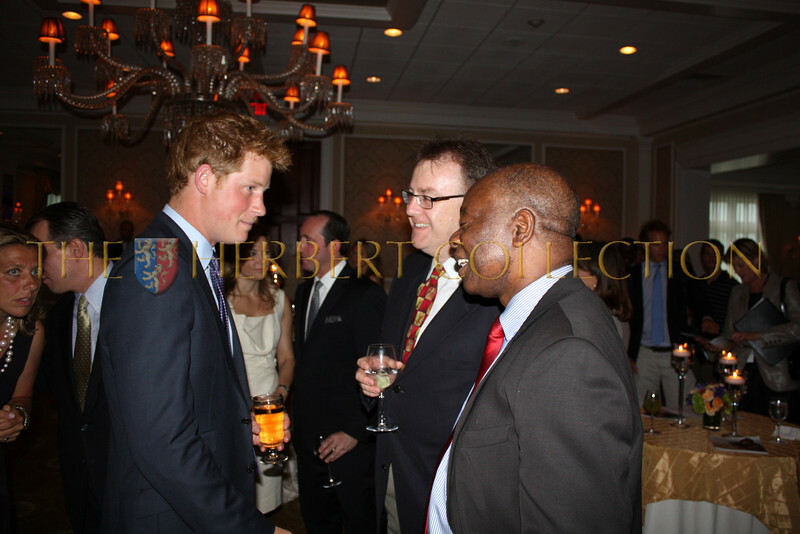 Prince Harry of Wales was hosted by Richard and Viosa Lukaj at the Greenwich Country Club to raise awareness for Sentebale, a charity for the vulnerable children of Lesotho. Sentebale means 'forget-me-not' in Lesotho and was founded by Prince Harry and Lesotho's Prince Seeiso in memory of their beloved mothers; Lady Diana, Princess of Wales and Queen Mamahato of Lesotho. It has been said that the Prince's chose the name as a memorial to the charity work of their mothers and as a reminder to all of us not to forget Lesotho or its children. The Kingdom of Lesotho is a landlocked country and enclave—entirely surrounded by the Republic of South Africa. Prince Harry moved through the small exclusive crowd along with our gracious host, Richard Lukaj from The Bank Street Group, making sure to greet everyone. Guests were excited to meet the handsome and poised Prince. Many welcomed him by volunteering to support his charitable endeavors. I was amongst those in awe to meet Harry, Prince of Wales, as my family ancestry has been traced back to Sir William Herbert of Raglan Castle, Wales during the 1400's. The Prince and Kedge Martin, Chief Executive of Sentebale spoke of the serious needs of the children in Lesotho who have become forgotten victims of poverty and of the HIV/AIDS epidemic ravaging the kingdom. Lesotho has the third largest HIV/AIDS rate in the world with 400,000 orphans and children in need of help, the population is about 2 million. It is admirable that Prince Harry is following in his mothers footsteps and going ahead with her charitable work. Prince Harry also discussed tomorrow's soccer match between England and Germany with guest Barry Klarberg who represents many entertainers and athletes saying that it will be an exciting game. The Prince will be playing Polo on Governor's Island in the Veuve Clicquot Polo Classic to benefit American Friends of Sentebale during the televised soccor match tomorrow. Most of us were sad that the USA lost to Ghana today but H.E. Ambassador Chidyausiku of Zimbabwe was pleased with the win. H.E. Ambassador Lorenzo who is putting together the MDG Awards for the second year is from the Dominican Republic and prefers baseball since a majority of pro players come from his country. Thanks to Richard Lukaj for bringing Prince Harry and this notable cause to Greenwich. Scott Singer, Head of Media and Entertainment investment banking and author of new release 'How to Hit a Curveball' and CEO Peter Rust and his wife were amongst the team from the Bank Street Group in attendance. The evening was charming as was the Prince.